WHAT IS CHEMOTHERAPY AND WHY WOULD MY pet NEED IT? Chemotherapy is a term given to a group of drugs that have the ability to kill cancer cells in dogs. The specific medication or combination will depend on the type of cancer your dog has, as well as his overall health. Chemotherapy is recommended for cancers that either have already spread to other areas of the body (metastasized) or are known to have a high potential for metastasis. The goal of chemotherapy in animals is different than for humans, which is why treatment is less aggressive. With pets, the primary goal of chemotherapy is to provide your cat or dog with the best quality of life for as long as possible. WHAT CAN I EXPECT DURING MY pet’S CHEMOTHERAPY TREATMENT? How chemotherapy is administered depends on the drug given. Most treatments are administered by injection and takes just a few seconds (Similar to a vaccination) to a few minutes. Some treatments involve intravenous drug infusions which sometimes takes a few hours. Bringing your pet's bed or blankets your pet is familiar with may help with the process or even bringing his favorite stuffed toy and sometimes bringing his best buddy along helps with the procedure as well to provide comfort and relieve stress. Frequency of treatments will depend on the type of cancer, the animal's overall health, the specific drug and family wishes. Most treatments are given in intervals ranging from once a week to once every three weeks. That frequency can last a couple of months, followed by every four to six weeks. The duration of the treatment is also dependent on the type of cancer and can last from a few months to a few years. 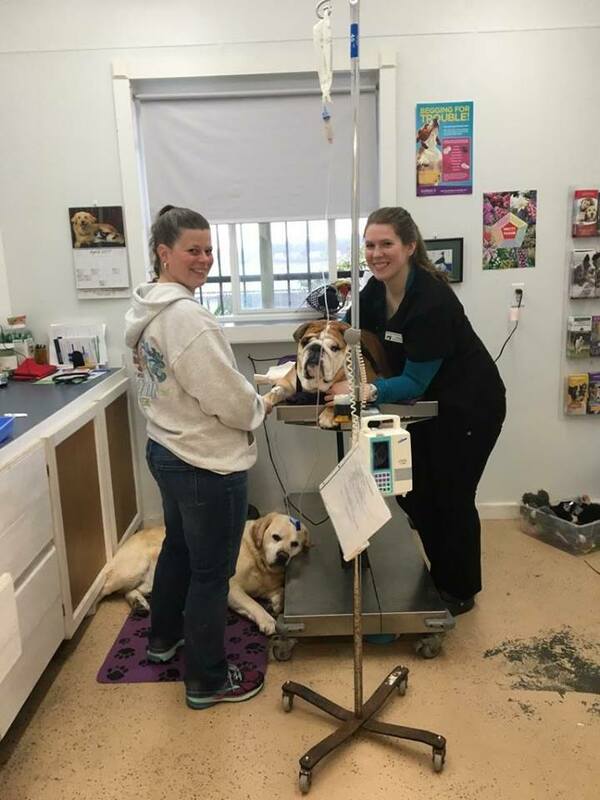 While in between treatments we need to monitor the animal and do routine urinalysis, blood work, and followup X-rays to make sure everything is going as planned. The drugs remain active in your pet's waste for the next few days after treatment, so pet parents are advised to be cautious and to wear gloves when cleaning up after their pet. Women who are pregnant or breastfeeding and those with weakened immune systems such as the elderly, should be particularly careful around their pet's waste. Depending on what type of drug that is used for the chemo make sure to read the doctors hand out for specific instructions and aftercare, some chemotherapy drugs you have to avoid having your pet lick people's bare skin. Here we have Mr. Tatertot who was going through a series of chemo treatments at the age of two years. We are so proud of Tater and his lovely cooperation through his treatments. Tater had Osteosarcoma and Hemangiosarcoma and we had to amputate his leg and remove his spleen. He brought his best doggy friend to his treatments to let off some steam before the procedure. His best friend never left his side.